PCC is the proud recipient of the Arbor Day Foundation’s Tree Campus USA designation, which honors colleges and universities that contribute to healthy community forests. PCC is the largest such recognized community college in the nation, and with an average of 20% tree canopy on our combined 1,500-square-mile footprint, our participation represents a remarkable commitment to protecting and enhancing the natural environments of our campuses. The establishment of a Campus Tree Advisory Committee, with at least one representative each from the student body, the faculty, Facilities Management Services, and a community member with experience working with trees. A Campus Tree Care Plan that establishes policy and guidelines for planting, maintaining, and removing trees. A Campus Tree Program with dedicated annual expenditures to ensure that adequate funding and staff time is provided in support of the program. Annual observance of National Arbor Day. Opportunities for students to participate in tree-related service learning projects. In addition to the five standards above, PCC’s District Campus Tree Advisory Committee is also working towards the completion of a tree inventory, the setting of a tree canopy coverage goal that integrates the PCC Climate Action Plan, and the propagation of the rare medlar tree at Rock Creek campus. For more information, contact the Campus Tree Advisory Committee. 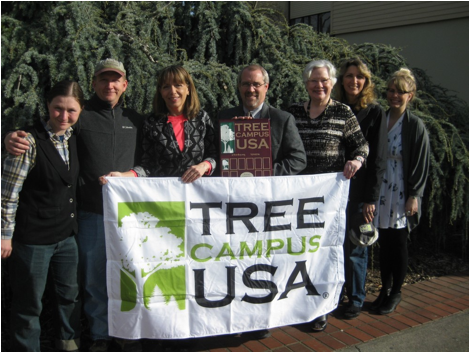 Why Tree Campus USA Certification? Trees play a critical role in the maintenance and health of PCC’s campuses. By providing shade and releasing water vapor in the summer, and by slowing cold winds in the winter, trees reduce buildings’ cooling and heating needs. Their root systems and canopies slow stormwater run-off, reducing erosion and preventing potentially harmful chemicals from reaching our waterways. An expansive and diverse tree population also provides habitats for a wide range of other wildlife, which improves biodiversity and overall ecosystem health. Further, trees contribute to more relaxing and enjoyable learning environments – no small matter for the thousands of students, faculty, and staff who visit our campuses daily. Of course, trees’ capacities to reduce atmospheric CO2, release oxygen through photosynthesis, and filter toxins from the air are perhaps their most valuable contributions to life on Earth. Their protection is critical in efforts to reduce emissions of greenhouse gases that worsen global climate change. Participation in the Tree Campus USA program, therefore, is in line with the goals stated in PCC’s Climate Action Plan, which establishes targets of a 40% reduction in our overall CO2 emissions by 2030, and an 80% reduction by 2050, when compared to 2006 levels. Earth’s remarkable systems do not stop at the edges of our campuses. PCC’s participation in the Tree Campus USA program, along with our certification in the Bee Campus USA program, is a clear commitment to ensuring that our campuses will continue to enrich not only our students and the community, but also the health and vitality of the natural environment – both on our grounds and beyond. Interested in getting involved in the committee? Want to include tree service learning in your course? Are you a student in need of CBL credit? Contact sustainability@pcc.edu[opens in new window] to learn about our opportunities for engagement.